Fred Astaire began his vaudeville career at five, and by their early 20’s he and sister Adele were dancing legends in the U.S. and Britain. The mere mention of his name evokes a debonair vision of elegance. With his perfectionism, creativity, and grace he redefined the movie musical, and he and partner Ginger Rogers set the standard for future dance pairings. But choreography and dance were not his only forte. He was a natural singer who introduced more songs by great American tunesmiths than anyone else, and he proved his skill as a dramatic actor in On the Beach (1959). After a highly successful Broadway career, Adele left the team to marry in 1932. Fred danced on stage with other partners. His first show without Adele was Gay Divorce (the film adaptation was renamed The Gay Divorcee due to objections from the Hays office) in which he introduced “Night and Day.” He was a leading man in his own right before receiving the call from Hollywood where he enjoyed even greater success. Astaire’s later partners included Rita Hayworth, Cyd Charisse, Vera Ellen, Leslie Caron, and Audrey Hepburn. He shows his comedic side in Easter Parade (1948) where he and Judy Garland dance as hoboes. Only once did he dance with Gene Kelly--in Ziegfeld Follies (1946)--but, always the diplomat, when asked to name his favorite partner he cites Kelly. 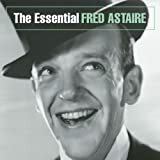 Astaire produced several TV specials, guested on many, made numerous films, and won awards for his multiple talents during a career that lasted into his eighties.